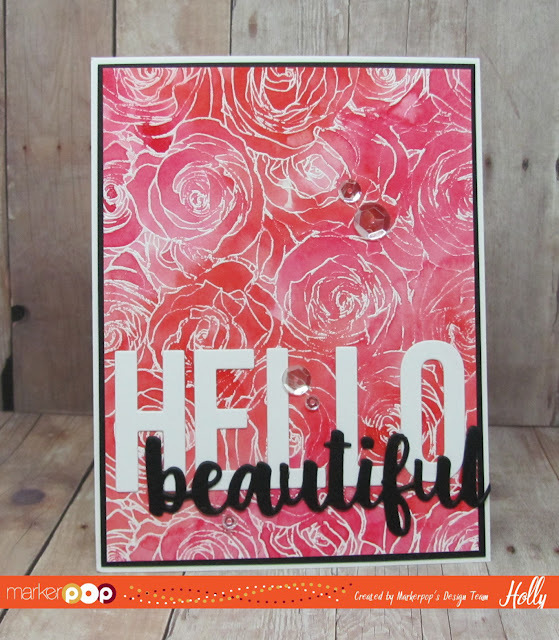 Hollybeary Creations : Hello Beautiful!! I'm up on the Markerpop blog today with another watercolor project. Today I’m using the Gansai Tambi 36 Ct. Watercolor set and the Roses All Over Background Stamp from My Favorite Things. I started out by stamping the Roses All Over background image onto a piece of watercolor paper using some VersaMark ink. Then I heat set it using some White Embossing powder. I tapped the panel to a board using some painters tape (this helps your paper from warping). I added water all over the panel with a large paintbrush, making sure the area was well saturated. Then using a damp paintbrush I dropped some of the Red #32 and Dark Pink #34 onto the image panel. I just let the colors flow into the clean water I placed down first. I used my heat tool to heat set it and then I went back in and repeated the process for a little darker look. Once the panel was dried I removed it from the board and trimmed it to size. I matted the panel on a piece of and then added those pieces to a top folding A2 size White card base. For the sentiment I die cut the Big Hello from MFT from some White card stock and adhered it across the card. Then I die cut the Beautiful from the Hello Beautiful Die from MFT. I die cut this twice and stacked the words together. Then I adhered them just over the Hello. I added some Sparkling Clear sequins from Pretty Pink Posh for a little sparkle. 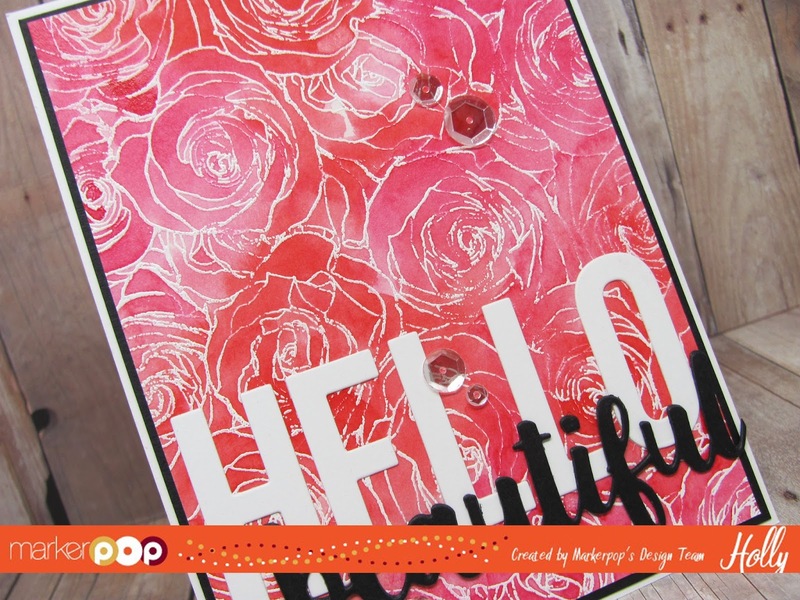 This is a great technique to use with this background stamp or any others like it. Be sure to head over to this Post here.. to find out how you can Win one of our Fabulous Watercolor Prizes this month.